In addition, there is a home compostable standard, OK Compost, which sets safe levels for composting in your garden. 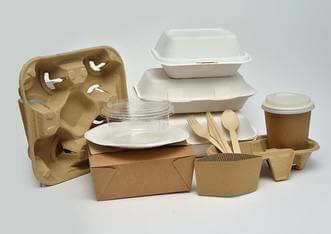 Essentially, being 'compostable' simply means packaging should break down safely into compost, in either the council's or your home composting facilities. Recycling simply means using things that have already been used, to make new things. So, it follows that being 'recyclable' makes it possible to turn old packaging into something new. For glass or cans, this is quite simple. The tricky thing is that a lot of packaging is plastic. While it is technically possible to recycle most, if not all plastic polymers, the complexity and cost of doing so has prevented this happening in the past. There are 4 main types of plastic; PET, HDPE, PP and PVC. Each packaging type will have a separate mark indicating the type of plastic, and hence how it should be recycled. But in every case, the recyclable mark tells you that something can be recycled, however you should check whether your council actually does recycle it. Being degradable simply means that something will eventually decay, perhaps over many, many years. There are all kinds of different standards for degradability, but they are very different to being biodegradable. When packaging is biodegradable, it can be broken down, so that the carbon atoms in the chains of the polymer are broken apart and can actually participate safely in the environment, or in the creation of other organic molecules, like our food, or in animals. That sounds complex, but it just means biodegradable packaging can safely become part of the ecosystem as it naturally breaks down over time. The crux of the matter is that biodegradable is the best environmental option of the two. Doran's new Edenware cups represent the top new sustainable technology in packaging. These are completely compostable cups, lined with plant-based Polylactic Acid (PLA), and they are made from certified biodegradable raw materials. With Doran's Edenware, you can always be sure you're opting for the most feasible and sustainable packaging options available. Contact us today if you're confused about the various definitions surrounding packaging, or for an informal chat through our product range and how it meets the various challenges out there.